The summer sun is here – yay! Whilst that’s great news for sun tans and family BBQs, the hot weather isn’t necessarily so good for our pets. It’s important to keep your dog cool in the summer months to ensure they stay healthy and don’t over-heat. The UK is having a marvellous heatwave this year and it’s certainly been a scorching summer that doesn’t show any signs of stopping soon. Here are 19 tips for keeping your dog cool and stopping them from getting too hot. 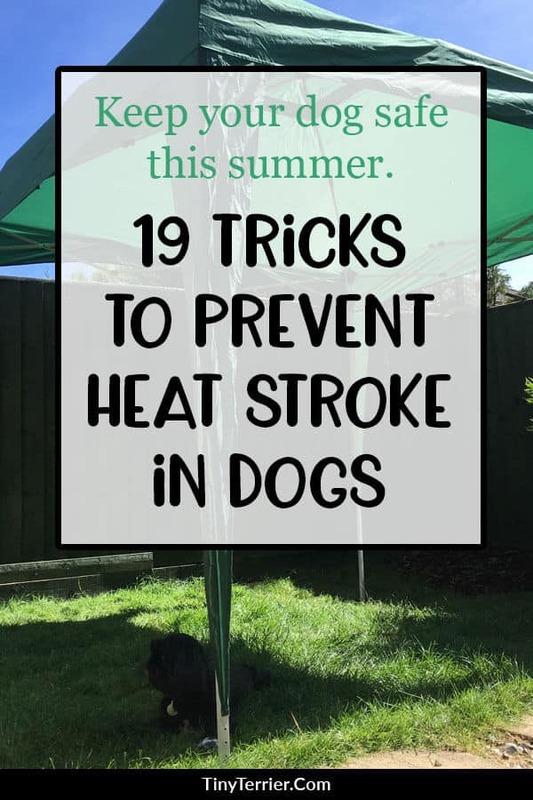 Please note that these ideas are intended to keep your dog cool during the summer – NOT to cool them down if they are already overheating. If your dog is overheating, phone your emergency vets to get immediate advice and cool your dog down slowly. Walking a dog on a hot day can cause them to overheat and develop heatstroke which is incredibly dangerous and can be deadly. On hot days, limit your dogs walks and only take them out in the early morning or late evening – and even then, only if it’s cool enough. 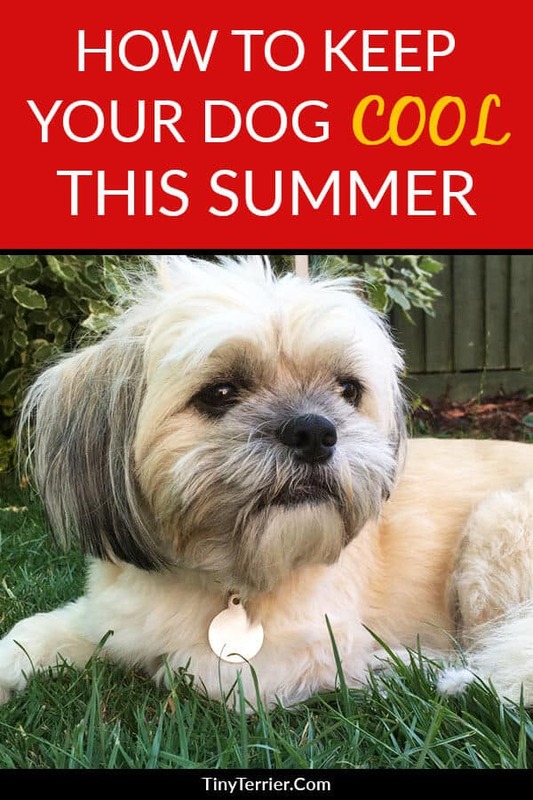 Do the ‘pavement test’ – place the back of your hand on the pavement and if it’s too hot to keep your hand there then it’s too hot to walk your dog. You don’t want them to burn their paws on the hot pavements and roads as that’s incredibly painful for them and takes a long time to recover from. 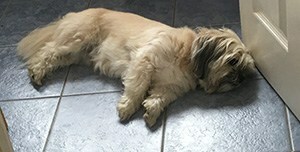 We have shih tzus and when it’s hot we get up early to walk them about 5.30am. Even then, when the sun hasn’t even come up properly, they can only do about a 15-minute walk before they have had enough. You know your dog better than anyone, so if you see that they are struggling with your normal length of walk then shorten it until the weather is cooler again. Some days we don’t even take our dogs out. 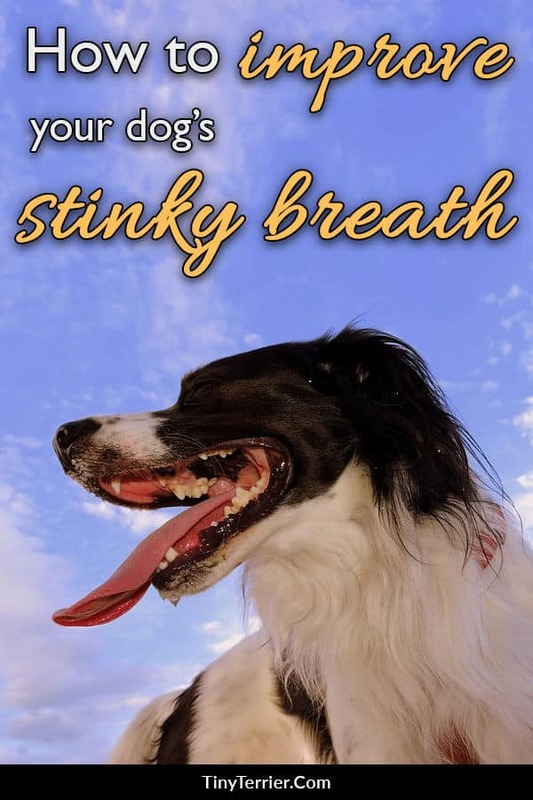 When they are getting out of breath and panting just from walking around the house and garden, they aren’t going to be able to cope with a walk. Missing one day of walkies is much safer than pushing them too hard and potentially causing heatstroke. Even though it’s lovely to have the doors and windows of your house open to let the breeze in, sometimes it’s better to keep your dog inside. 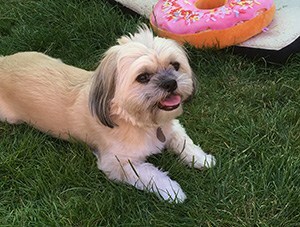 During the heat of the afternoon when it’s hottest, some dogs love to go and lie in the sun but this can allow them to become too hot and then struggle to cool down again. 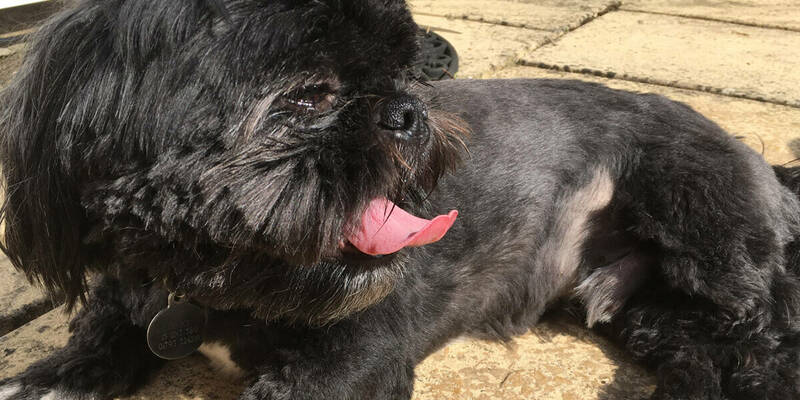 Freddie loves to lie in the sunshine, and luckily for us he is usually sensible enough to only stay out a couple of minutes, however we keep him inside during especially hot times as it’s just not safe for him to lie in the direct sun. A dog doesn’t always know what’s best for them – it’s up to you as a responsible dog owner to make sure they don’t get too hot in the direct sunlight. This year we’ve bought a couple of dog cooling mats. One of our dogs won’t go near them, but the other loves it. He is probably spending a good 2-3 hours throughout the day snoozing on the cooling mat. 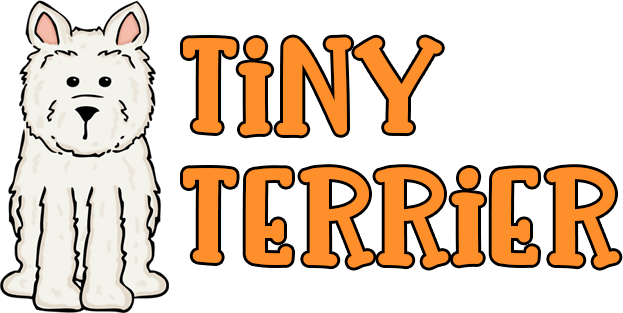 We managed to pick ours up cheap at B&M but they are also available on Amazon and in most pet stores. If you’re feeling crafty then you could even make your own – here’s a great tutorial. Cooling towels and cool coats are similar to cooling mats but they require a little more effort on your part. Whereas cooling mats can just be left around the house, cooling towels need to be soaked in water before covering your pet. 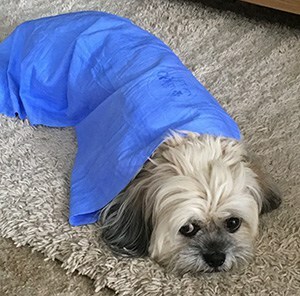 We have a couple of cooling towels; all they need is a quick soak in some cold water (we add ice cubes and swirl the water around the make it even cooler) and then you wring them out and place them on your dog. It seems counterintuitive to add a towel or coat to your dog when they are already warm, but the material stays cool for quite a while. A paddling pool can be a wonderful way to keep your dog cool. Many dogs love water, especially if you have a breed like a spaniel, retriever or Newfoundland who are expert swimmers! We tried a padding pool a couple of years ago and both of our dogs were afraid of it. No matter how much we tried, they weren’t comfortable using it so in the end we gave up with that idea. Don’t let your dog miss out on all the yummy summer ice lollies and ice cream! You can make doggy-friendly frozen treats with just a few simple ingredients that you’ve probably already got around the house. My dogs love to crunch on a doggie ice lolly, especially these strawberry and apple frozen dog treats. Does anyone else’s dog get super fussy about their water bowls when the weather is hot, or is it just mine? My Freddie gets such a fuss-pot over his water which is frustrating when it’s warm as he doesn’t drink as much as he probably should. One way we combat this is by filling up extra bowls of water and placing them around the house, including one outside. When it’s warm he tends to like drinking outside rather than from his normal bowl in the kitchen. Bowls of water can warm up quickly in summer which can make them seem unappetising to dogs – especially fussy ones like mine! A great way to keep water cooler for longer is by chucking in a couple of ice cubes. They will slowly melt over time and keep the water nice and cold. Brain training games are perfect for when it’s too hot to go for a walk or run around in the garden. Playing with interactive dog toys or creating your own puzzle games can tire your dog out just as much as physical activity. By making them use their minds to solve a problem or find a treat you can help them burn off their excess energy without getting overexerted. 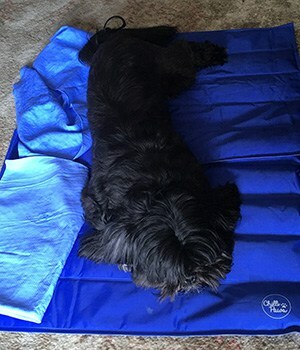 What’s better than a cooling mat? A cooling mat with a fan nearby of course! Freddie is scared of fans (seriously, my dog is a wimp!) but Socks loves to lie on his cooling mat in the breeze of the fan. You can give extra cooling power by placing a bowl of ice or a frozen water bottle in front of the fan. When it blows the air it moves around the condensation from the ice which helps to cool the air, rather than the fan just moving around the already-warm air of the room. Our bathroom has stone tiles which make it one of our dog’s favourite places to lie on cool days. 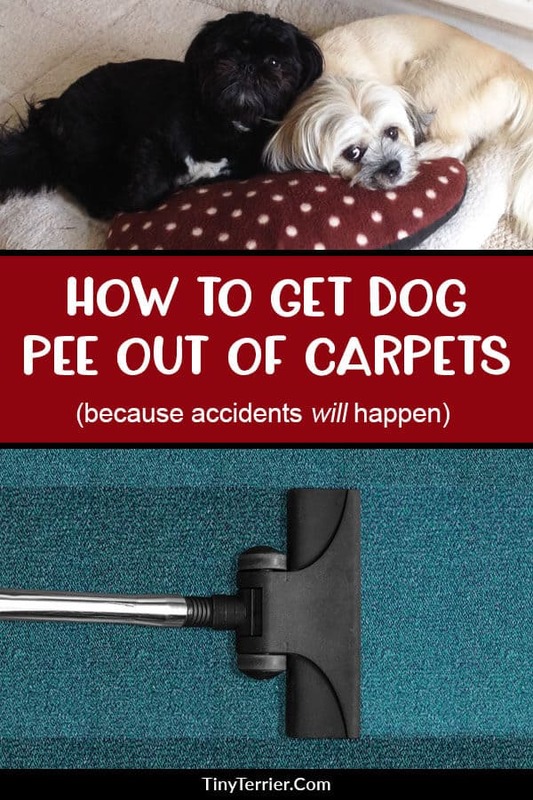 If you usually only allow your dog in certain rooms of the house then consider relaxing your rules when it’s really hot if some of your other rooms have cold floors. We’ve also found that since replacing our hallway from carpet to vinyl the dogs have spent far more time lying in there when it’s warm. If your garden doesn’t have much natural shade then try to find a way to create some. We bought a marquee which we put up when it’s not windy. 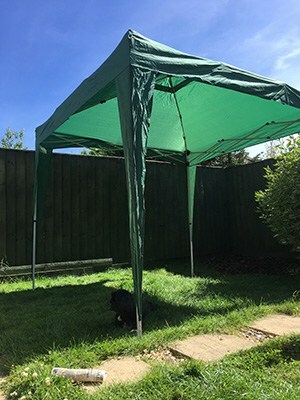 This gives shade throughout the day as the sun moves around, and it’s definitely cooler sat underneath it than directly out in the sun. It’s great for us too – we bring a blanket out and sit on the grass in the shade for a much-needed cup of tea (or cheeky glass of nice cold wine!) in the fresh air – bliss! My dogs love frozen Kongs. There are many different ‘recipes’ online for stuffing a Kong. As we feed our dogs a mixture of dry and wet food anyway, we tend to just mix it together with some added water and peanut butter, then put it in Kongs with some added treats and freeze it for around 4 hours before dinner time. Frozen Kongs have many benefits – it’s cooling, it’s a great enrichment activity that tires them out without physical exertion and it takes about an hour for them to finish them which helps them pass the time when it’s too hot to take them out on a walk. We tend to take the Kongs out the freeze for around 10-15 minutes before giving them to the dogs so that the mixture has time to thaw out slightly and become a bit ‘mushy’. This makes it easier for them to eat it. One of our dogs is quite fussy and won’t eat it if it’s still completely frozen – I think it’s too cold for him! Sometimes the best way to keep your dog happy in the heat of the day is just to leave them alone. If they are feeling hot and bothered then the last thing they want is for you to be fussing over them. 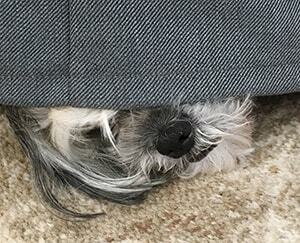 Freddie likes to go and lie underneath the sofa for large parts of the day when its hot. Not only is it cooler under there, but it’s his way of letting us know that he wants to be left alone. Respect your dog’s wishes and pick up on their signals to ensure you give them the space that they need. If your dog struggles to sleep at night in the heat or can’t find a cool place to lie, then a cooling cuddler might be what they need! Simply freeze a large bottle of water and then wrap in securely in a hand towel and place it where your dog likes to sleep. They can push up against the bottle and keep cool, and the towel protects them from getting too cold from the ice. 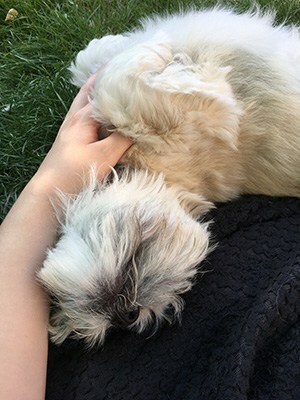 One of my shih tzus likes to be brushed in the summer. I spray him with a coat conditioner before I brush him, which helps to detangle some of this fur and stops the brush pulling so much. This has the added bonus of cooling him down – especially if I put the bottle in the fridge for an hour before I brush him! 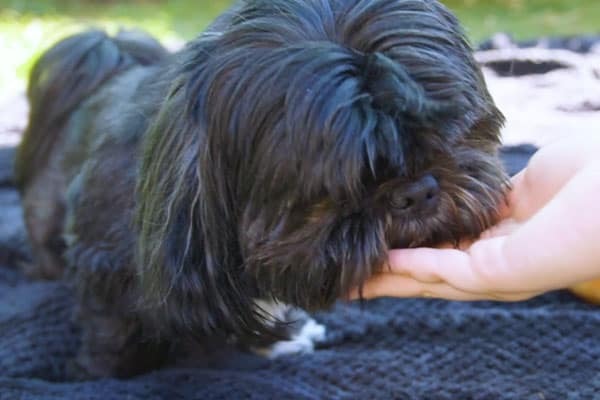 If your dog sheds their fur (shih tzus don’t shed) then giving them a really good brush out in the summer can help them to keep cool. 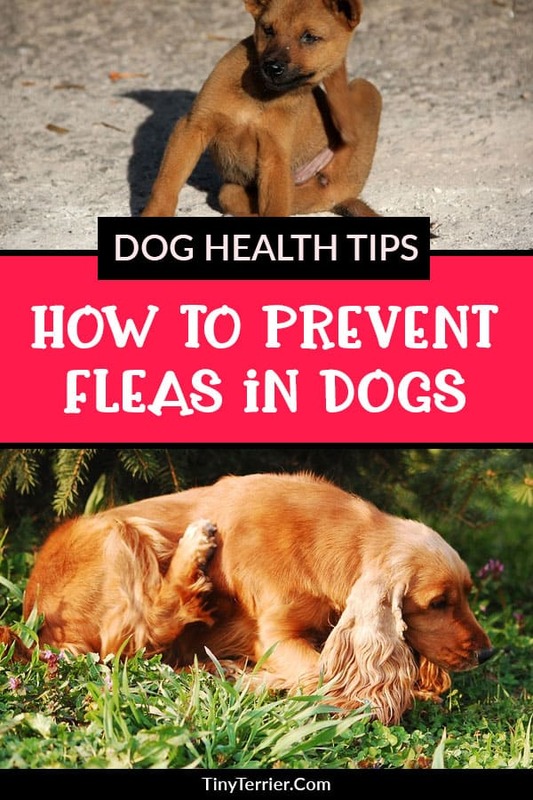 You’ll be brushing out all the dead hairs that have got stuck in their coat that they don’t need any more. All those handfuls of fur that you get out (especially on larger dogs like retrievers!) 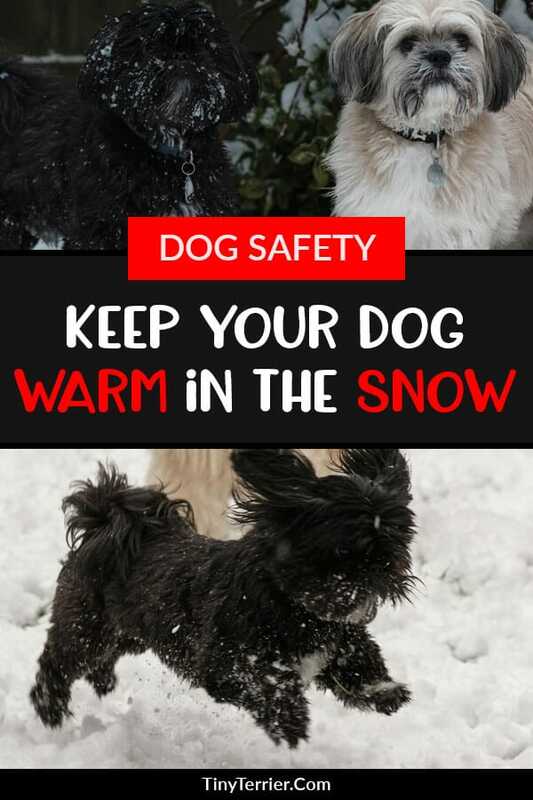 mean that your dog is a little bit lighter and not so hot. A trip to the groomers for a hair cut may help your dog to stay a bit cooler. However, be careful with your grooming methods, especially if you have a double-coated dog such as a shih tzu, golden retriever or collie. Double-coated dogs shouldn’t be shaved when the weather is hot because their fur acts as an insulator which helps to regulate their temperature. If you shave them then they may get sunburnt as their skin isn’t protected, as well as overheat as they have no way of naturally cooling their body temperature. 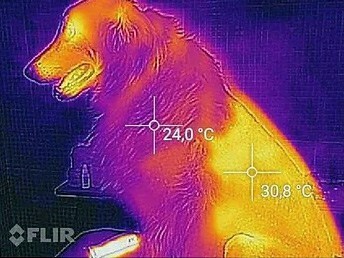 As you can see, the dog is significantly hotter on the shaved parts of his body rather than where the fur has been left long. Your dog groomer should be able to recommend the most appropriate summer cut for your dog’s coat. As much as we love to take our dogs everywhere with us, sometimes it’s kinder (and safer) to leave them at home. Car journeys in hot weather can be fatal to dogs, even if you have the air conditioning on. My husband popped in to our vets the other week to pick up some tablets and was speaking to one of the veterinary assistants about the recent hot weather. She told him about a case from a couple of years ago where someone was driving their two pugs in the car and they overheated, despite air conditioning and windows open. They were taken straight to the vets but sadly they didn’t make it. When the weather is hot, if your dog isn’t essential to the journey then it may be best to leave them at home. I should hope that this goes without saying, but if you do take your dog on a car journey with you then NEVER leave them in the car. During this recent hot spell in England I’ve seen so many articles and stories shared on Facebook of instances where members of the public have broken in to cars to rescue does that have been left in cars during sweltering temperatures. It could only take a couple of minutes for the car to reach dangerous temperatures and for your dog to overheat. No quick pop to the shops or chat with a friend is ever worth the life of your dog. If you know that you are going somewhere that means your dog must be left in the car, just leave them at home. 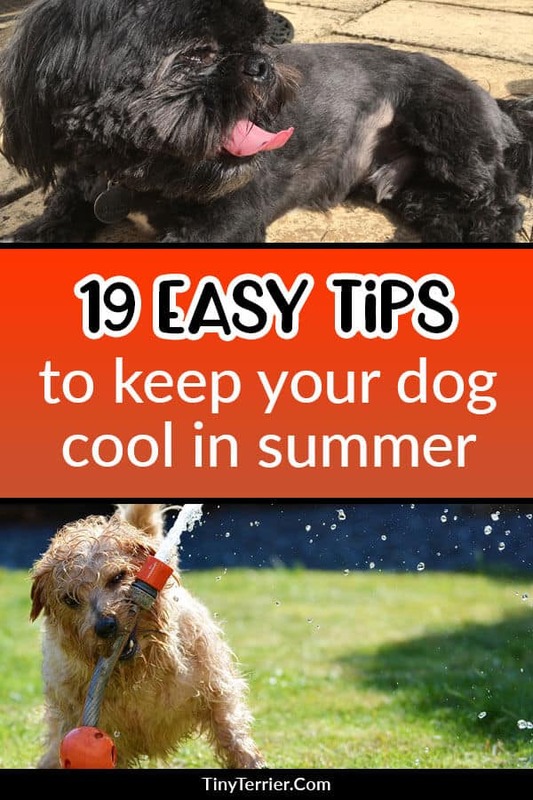 Please take a second to share "How to Keep your Dog Cool in Summer" on Pinterest.